Rising Inequality – Why Don’t We Care? There’s an interesting “Room for Debate” series in the NY Times titled “Rising Wealth Inequality – Should we Care?“. 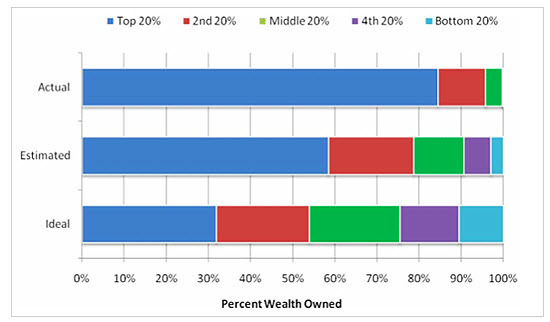 The series was sparked by an intriguing survey by Michael Norton and Dan Ariely that found that Americans generally estimate that wealth distribution is far more equal than it actually is and, if given a choice, they would select an even more equitable distribution as being the ideal scenario. The graph below shows the results of the survey. Of course there will always be a uneven distribution of wealth, and that in and of itself is not a bad thing. Systems such as communism and socialism have proven to be an ineffective way of raising standards of living, whereas capitalism has done a pretty good job on the whole. But are the wealthiest 1% or 10% of our nation (or of any nation) actually contributing to their society in a manner proportionate with their wealth? Are they wealthy because they’re reaping the rewards of their hard work, or is it a matter of inheritance, loopholes, and offshore accounts? It seems that the economic theory known as “trickle-down economics” – in which you give the wealthy more of their money through a lowering of taxes in the belief that they will spend more, thus fueling economic growth – has largely been proven to be bogus. The wealthy spend a proportionately smaller share of their income than do people further down the socioeconomic ladder. The rest goes into investments. What most confuses me is why so many people who are middle class or lower, are against raising taxes on the ultra-wealthy. They seem to hold a belief that they may one day be in that top few percent and have to pay that “too high” a marginal tax rate, when in reality their only realistic chance of becoming a millionaire, let alone a billionaire, is to win the lottery. Heck, even Warren Buffet, one of the nation’s wealthiest men, says he needs to be paying a higher tax rate. Why don’t people seem to care about rising inequality? Is the rising inequality something we should be concerned about? Is that lack of caring about it also something we should be concerned about? This entry was posted in Uncategorized and tagged Economy, equality, Inequality, politics, Taxes, Wealth by christao408. Bookmark the permalink. There seems to be this perception that if you’re against this inequality, then you must be one of those left wing socialist. “Greed is good.” I have no issues against raising taxes for the super wealthy. They have more than enough money and they’ll continue to shelter them through many different ways. I think people do care but many of us don’t have faith that allowing the government to tax wealth and take it out of the hands of some people will truly result in a more equitable distribution. I know I don’t. Also, “ultra-wealthy”…I can’t think of the last time someone asked me if I was okay with raising taxes on the “ultra-wealthy.” I don’t consider $250,000 per year “ultra-wealthy” loophole inheritance off-shore account material. I’m not very “into” politics, but it seems clear to me that there is great power in how politicians sell their agendas. Republicans, whom traditionally protect the ultra rich, focus on other issues people are adamant about, the pro-life topic being one of the major ones. I mean, if I were an adamant pro-lifer, I would probably find it difficult to vote for a party that supports choice in that matter. A lot of people do vote based on this one topic alone. How many other topics are there that inadvertently reinforce rising financial inequality? I’m pretty sure we can all think of a few more. But I think murisopsis is right in that, eventually as this trend continues, there will come a time of extreme crisis and upheaval. I just wonder how much upheaval and crisis it will take before people wake up and realize other topics are really important, too. what is it these days with everyone on xanga wanting to end blogs with questions?! I watch with fear the disappearance of the middle class. I am not a history major but that seemed to precede a major change in the social climate and stability. I’d love to see the top 1% included on the chart in a different color, too. I’ve also seen figures showing the almost exponentially widening gap over the years between the average employee’s salary at a company and the CEO’s salary. In light of all this, I find it absolutely maddening that we would rather cut programs benefiting the people you can’t even really see on the chart for actual wealth — those on the bottom — than raise taxes on the top anything. all I can say is YUP..and don’t hate me because Michelle Bachman is from my state…I already hate myself for it! I’m mad as hell and have been since the eighties. For awhile there things were looking good for the middle class, everybody had as many TV’s, computers, video games, cell phones and etc. as they could manage at one time, and so no one seemed to notice or, if they did, they didn’t mind because the American Dream was still alive and well. The party seems to be pretty much over at this point and it’s a big surprise to most folks. There are others who still don’t understand what happened here because, well, not everyone is paying good attention. They’ll catch up later. Sad what’s happening in this country. I am concerned about this, as I see middle class people (such as my family) continually suffer while the rich get richer. What can be done about it? I care. I’m furious about it. i also care… and this is frustrating – but what can we do?!?!?!p.s. “Of course there will always be a uneven distribution of wealth, and that in and of itself is not a bad thing. Systems such as communism and socialism have proven to be an ineffective way of raising standards of living, whereas capitalism has done a pretty good job on the whole. But are the wealthiest 1% or 10% of our nation (or of any nation) actually contributing to their society in a manner proportionate with their wealth? Are they wealthy because they’re reaping the rewards of their hard work, or is it a matter of inheritance, loopholes, and offshore accounts?” – WELL SAID! could not agree w/ u more!!!!! @ordinarybutloud – I’m not sure that 250k is “ultra-wealthy” either. As near as I can figure, 97-98% of Americans have a household income less than $250k a year and the median household income in the US is about 50k a year. So whether we call 250k “ultra” wealthy or just “five times better off than the median US household”, it is starting to reach a high level of wealth. Perhaps we raise the bar to 500k? There don’t seem to be any easy answers, but the fact that there is such great inequality in the US strikes me as problematic. @AppsScraps – It promotes discussion. I know you aren’t a big fan of the back-and-forth commenting on blogs, but some people like it. @christao408 – the difference between 250K and “ultra-wealthy” for me is that 250K is attainable for the professional class working on salary with no inheritance or loophole “investments” while “ultra-wealthy” is not. I’ve actually been thinking about this post since you wrote it. I think a more even distribution of wealth is a laudable goal and perhaps even a moral requirement. But how to accomplish it? And at whose expense? These are the kinds of questions that are never satisfactorily answered. I have no problem with the Trump empire handing out wealth to the underclass. But on the other hand I do have a problem with high rates of taxation applied to salaried professionals that result in a continued uneven distribution of wealth…just distributed differently. If someone ran on a platform advocating a simplified progressive taxation system eliminating deductions and loopholes and exceptions I’d be *all for it*, even if it resulted in overall higher taxes for me personally or people just above our household income level (the Attainable Dream, I’ll call it). But a general, “raise taxes on people making 250K or more” does not inspire confidence. I suspect that means, “knock the professionals down a few pegs and continue allowing the Fat Cats to buy our legislators and skate out of taxes.” And of course, by “professionals” I mean people who have invested a lot of time, money and effort to develop highly paid skills, like doctors, accountants, lawyers and others. @throughthinking – @Kristenmomof3 – @Ikwa – @yang1815 – Thanks, everyone, for the comments. It is nice to have a discussion, even when we don’t all see things the same way. @Sinful_Sundae – @gottobereal64 – As for your question, “What can we do about it?” I think the answer is, we must keep informed and involved. Signing up for email updates from your Representative and Senators is a good start. Emailing them back about legislation is also important. @nurseynursey – Your comment that people are not paying attention rings true. I think for most of us, just taking care of our own daily business is taxing enough. Having to pay attention to these larger questions takes energy many people feel they don’t have. @portiajules – Yeah, how did you guys elect her? =P@kunhuo42 – It seems to be a self-reinforcing cycle. The wealthy, like everyone else, work to protect themselves. But since the wealthy have the money, and thus the influence, their self-protection work is more productive. @epiginoskete – If the top 1% were in a different color, the chart would be even more interesting, agreed. @Fatcat723 – id=”x93932863″>@murisopsis – It doesn’t take much to imagine some major upheaval as inequality reaches too extreme a point. @ElusiveWords – True, the polarizing labels don’t help in having a discussion. There isn’t a perfect answer, but more conversation can help us arrive at a better understanding of what balance should be achieved. @Ikwa – I totally agree with you . @Ikwa – Yeah, it was a more general comment to all responders, but I realize it was a bit unclear. @christao408 – Interestingly, the political rhetoric (Obama’s, for example) concerns annual income, while the chart on your post concerns “wealth.” I was so interested in this topic I clicked on the link you provided and I found a lot of interesting essays and realized I hadn’t been thinking in terms of “net wealth.” One of the essays pointed out that lots of the members of the middle class have a negative net wealth but still a decent standard of living. This is what bothers me about rhetoric re: annual family income. It’s not the same as people who “own the majority of wealth.” Annual income is not the same as net wealth (obviously). In some situations it may be true that “people who are making more money are more able to contribute to the larger society and have some responsibility to do so,” but that statement involves a lot of assumptions, doesn’t it? Geographical norms, for example? Kids or no kids? If we are speaking purely in generalities I think we would probably agree on nearly everything…richer people should help poorer people, for example. But it’s the specifics that cause the problems. So people in the “middle class,” like myself, who choose not to vote for higher taxes might not be bogged down on the generalities. We might be bogged down on the plain ‘ol specifics: who is going to get the money and what are they going to do with it? I think people who have offshore accounts and tax loopholes and inheritances are a very very very small minority of people. Certainly I don’t know any people like that, here in the stratosphere of the upper middle professional class. @christao408 – its ok 🙂 I think this is why MOst of my friends who are from other countries are moving away. Totally unfair how things are run here. IN fact Most weathy nations share the3 wealth for the good of their country like Sweden, Denmark, and Canada. Canada is where my sister is planning on moving. The country realizes that every person needs a voice in the government, even the poor. @ordinarybutloud – it is NOT about being a helper to the poor but sharing the income of wealth for workers and the middle class. @Ikwa – I’m sorry but I just don’t understand what you’re trying to say. What do you mean by, “sharing the income of wealth for workers and the middle class?” I am both a worker and middle class. I don’t know what “sharing the income of wealth” means. And since we’ve been commenting on each other’s blogs for years, I know you’re not offended that I honestly don’t understand what you’re trying to say. @ordinarybutloud – share the wealth is what Obama was talking about in his campaign./ The fact is the margin between rich a poor is widening with poor increasing compared to those who are wealthy. Middle class is becoming poorer and poorer due to the top 1%. SHARE the profits earned by sharing the wealth. @Ikwa – okay. I understood what Obama was saying in his campaign. I understand about wealth disparity. I am uncertain about what you envision by sharing the profits earned by sharing the wealth. Are you thinking people at the top should pay more taxes and people at the bottom should get checks from the government? Are you thinking people who own large companies should pay their employees more? If someone pays me $5000 to write his appeal because he was convicted, what should happen to that $5000? Should I keep it? Should I give half of it to the government? Should I give half of it directly to poorer people? I’m wondering how you think it should work, the SHARING. @ordinarybutloud – Yes I think Our government should not only tax them more they should PAY fair wages. This has nothing to do with what you get paid but what Americans are trying to live off of and still can’t make ends meet like my Sister who works 2 jobs and so does her husband BUT still get state assistance since they both cannot make enough to afford health insurance. Don’t take every jab at Wealthy Americans to mean you if you are a middle class American you would actually know what I am talking about. You have such a phobia of BIG government. I am more scared we are going to be a corporate run country more. That is more like Big brother than you can imagine. Maybe you never worked for a company like them? My husband did. I did. My sister did my BIL did its scary what they do as a business practice. @Ikwa – I’m just trying to figure out which people you are hoping will share and how you’re hoping they will do it. I worked for General Mills for a while when I was younger but I worked for tips so a fair wage was never really part of the deal. I mean, the wage was beside the point. It was all a matter of what you could get people to give you, in cash. Other than that, no, I’m not really a corporate person. I’ve worked for the government, for private companies and for myself. The difference between BIG government and BIG corporations is you can avoid big corporations if you don’t like them (like I do). But you can’t do anything about the government once it decides to interfere in your life. I don’t take jabs at wealthy Americans to mean me. I don’t pay any wages. I didn’t inherit any money. I don’t have any offshore accounts or vacation homes or get any tax loopholes. I pay a mortgage just like everyone else. I just have a hard time imagining how taking money from one person to give it to another person is fair. I think a higher minimum wage makes sense. Better educational opportunities make sense. A streamlined tax system and the elimination of random subsidies and deductions makes a lot of sense, to me. Then maybe it would be clearer to all of us where money is coming from and where it’s going. @ordinarybutloud – I think if we came up with a simpler and more transparent tax system, it would be much easier for us to provide the true “level playing field” in terms of education and opportunity for people. @christao408 – I agree completely. I would like to see a much more level playing field. I realize it’s hard to accomplish that. A lot of education begins at home, and I say that based on personal experience. Still it would be nice if it were more of a meritocracy and less of a lottery.